Grow your veggies! Whether you’re looking to fill a garden or a patio pot, SowHow will get you going with easy-to-follow advice for beginners. When you’re growing vegetables for the first time, it can be hard to know where to start and even harder to find simple, understandable advice. 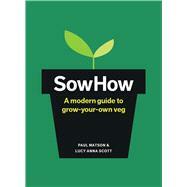 Enter SowHow – the innovative guide for the modern gardener. Featuring a fresh, bright design and clear-cut instructions, it includes entries on more than 30 easy-grow vegetables to sow throughout the seasons, from kale to runner beans and carrots to cucamelons. SowHow breaks down the key steps of sowing, planting, and harvesting each featured vegetable into bite-sized chunks with smart infographics, and covers everything from top tools and crop rotations to uncomplicated compost and mulches. Paul Matson is a Bristol-based book designer and founder of SowHow. Inspired by his experiences on his allotment, he developed the brand’s original, easy-to-use aesthetic before launching the company in 2014. Paul creates inspiring grow guides packaged together with high-quality organic seeds to help first-time gardeners produce first-class vegetables. Lucy Anna Scott is a writer with an artistic interest in stories that explore how plants, trees, and landscapes help us better understand ourselves. She co-creates Lost in London, an indie magazine that explores the city’s wild landscapes. Her first book, Lost in London: Adventures in the City’s Wild Outdoors, was published by Portico in 2013.